Trust me, my friends, this is the year sustainable transportation blows up in Chicago. Say what you want about Rahm Emanuel’s record on education, crime and privatization. But since he took office in early 2011, joined by forward-thinking Transportation Commissioner Gabe Klein and shrewd CTA President Forrest Claypool, the city has embarked on a number of bold projects to encourage walking, biking and transit use. I promise the next three months are going to be a tipping point as we make the move from the car-centric status quo to becoming a healthier, more efficient and more vibrant city. Where to start? The elephant in the room is the south Red Line shutdown, or rehab, depending on whether you see the glass as half empty or half full. Launched last Sunday, this $425 million project has closed the entire line south of Roosevelt for an extreme makeover, featuring the elimination of slow zones through track replacement, plus station enhancements. It’s true the work is forcing South Siders to dramatically alter their commutes for the next five months, but the alternative to a complete closure would have been four more years of weekend work and $75 million in additional costs. The CTA appears to have done a solid job of getting the word out about the overhaul, and is providing numerous alternatives, like free shuttle buses to and train rides from the Green Line’s Garfield stop. In October customers will be rewarded for their patience with a twenty-minute-faster roundtrip from 95th Street to the Loop. The South Side will also be getting a new El station with the $50 million Cermak Green Line stop, a stone’s throw from McCormick Place, slated for June construction. And, starting this summer, the Wilson Red Line station, often cited as the system’s most disgusting facility, will undergo a complete reconstruction that will transform it into a transfer point between Red and Purple Express service, albeit at a jaw-dropping $203 million price tag. One summer transit initiative I’m less excited about is the debut of the Ventra payment system. While it should cause no problems for the majority of Chicagoans, I’m worried about the impact on low-income residents, since cash fare for El rides will spike from $2.25 to $3. You can avoid this increase by buying a reusable fare card for $5, which is refunded to you as a transit credit if you register it within ninety days, but this requires having a sawbuck in your hand, plus access to a phone, the Internet, or the CTA headquarters. Plus, when you register, you’ll be given the option of activating the card as a prepaid debit card with numerous hidden fees, a temptation that many unbanked folks can ill afford. On a more positive note, this summer construction will start on the Bloomingdale, the 2.65-mile, $91 million elevated greenway and linear park that will have a huge positive impact on the Northwest Side. While it promises to be a gorgeous, Millennium Park-quality facility, unlike New York’s celebrated High Line it won’t just be a tourist attraction. The Bloomingdale will provide much-needed additional green space and a handy, car-free walking and biking route, since it will connect to a number of parks, schools and transit lines. But the real game-changer this summer will be a massive increase in cycling. Klein has already made waves by installing dozens of miles of protected and buffered lanes, in keeping with Emanuel’s grand plan for 100 miles by 2015. Most dramatically, he turned a Dearborn car lane into a two-way protected bike lane, which immediately made the street feel less like a speedway and more like the civilized business, retail and residential corridor it was meant to be. Now Milwaukee Avenue is about to undergo a similar transformation. 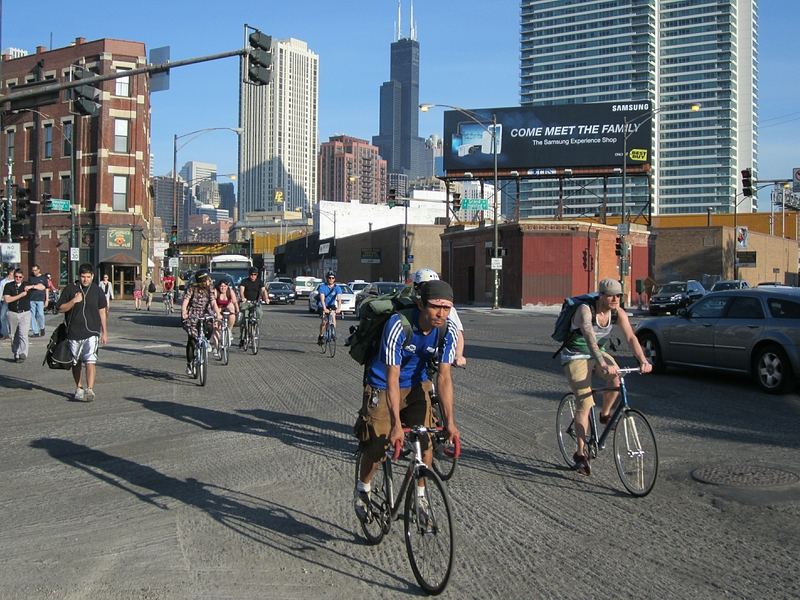 Last week the Chicago Department of Transportation began repaving the street to make way for long-awaited protected bike lanes that will be the missing link between existing PBLs on Kinzie and Elston. This gutsy project will involve relocating about half of the car parking spaces on the strip to side streets—expect to hear plenty of grumbling from motorists. Milwaukee and other new PBLs, plus a “neighborhood greenway” bike-priority, traffic-calmed street debuting on Berteau between Lincoln and Clark this summer, are sure to encourage new folks to try urban cycling. But what’s really going to make biking explode is the Divvy bike-share system, a $22 million network of 4,000 vehicles at about 400 docking stations, which should launch by the Bike to Work Rally on Friday, June 14, in Daley Plaza. This do-it-yourself public transit system, featuring comfy cruisers for short trips and errands, will eliminate barriers to cycling for thousands of residents and visitors. As has been the case in other bike-share cities, we’re going to hear business owners and landlords griping as CDOT begins installing docking stations in front of their property, but once they understand how the facilities attract customers and tenants they’ll be begging for the stations. There’ll be hand-wringing about the many new, helmet-less riders on the streets, but this will actually make cycling safer by forcing motorists to watch out for bikes and think twice before opening their doors. Mark my words, after this summer there’ll be no turning back.